Placing an order could not be easier. Browse our web-site, and click on any items that you wish to purchase and add them into the shopping basket. Once you have finished your selection, click on ‘Checkout’ and your Total Cost, including delivery costs, will be confirmed. To process and dispatch your order we will require some further details. You will be able to amend your order up to the point that you press ‘Submit’. We accept credit and debit card payment in a variety of options powered by WorldPay, We do not charge for items until they are ready to ship. All payments are encrypted in the software, so you can trust that your details are safe when ordering with Pogles Wood Florist. We reserve the right to alter details or designs of products illustrated without notice. We will inform you as soon as possible if the goods you have ordered are not available or in stock. It is therefore essential that we have either your telephone/fax number or email address so that we can contact you. 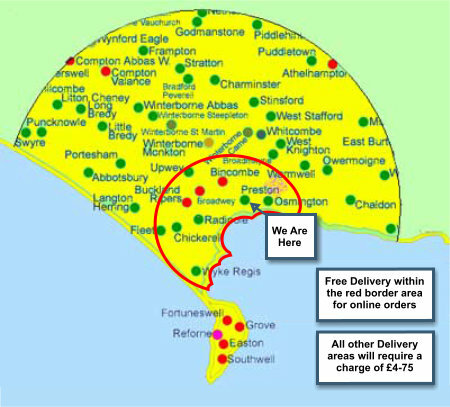 Pogles Wood Florist is registered under the UK 1998 Data Protection Act. Pogles Wood Florist does not disclose buyers’ information to third parties. It is not our policy to send marketing materials or unsolicited emails to our customers. Any information we request is only used for the purpose confirming details and fulfilling your order. Cookies are used on the site solely to keep track of the contents of your shopping basket once you have selected an item. If you are not satisfied when you receive the goods from us, please refer to the Returns Policy section to obtain a refund. However, due to the nature of our products, we are unable to offer guarantees. If you need to reach us, please email us on this email address, alternatively, you can call on 01305 834 834 or write to us at Pogles Wood Florists, 9 Preston Road, Weymouth, Dorset, United Kingdom. If you’re in the area, feel free to pop in and see us! If you are not fully satisfied with your order, you have the right to cancel/return your order within two (2) working days of receipt of goods, notification must be in writing. Return the goods in a new condition, in the original packaging, together with the delivery note. The cost of return is the responsibility of the customer. We cannot accept responsibility for returned goods if they are lost in transit to us. It is the customer’s responsibility to obtain Proof of Posting or to adequately insure the goods against loss. A relevant refund will then be given, please note that credit/debit card refunds my take up to 10 working days. Purchases of products on this web site are governed by English Law and will be deemed to have taken place in England and subject to the exclusive jurisdiction of the English Courts. Your statutory rights are not affected. This statement does not confer upon you any additional legal obligations or duties, it merely highlights existing rights that consumers have whenever they deal with traders. All material on this web site is copyright © of Pogles Wood Florist. Any use of this website or its contents, including copying or storing it or them in whole or part, other than for personal, non–commercial use is prohibited without the written permission of Pogles Wood Florist. You may not modify, distribute or re–post anything on this website for any purpose. If you are experiencing pop up problems when you try to access the larger images we have available, you may need to disable the pop up blocker in your browser! Due to the antics of advertisers and irresponsible web folks, there have been many occasions that pop ups have been used to deliver messages, spam and things that generally annoy normal good folks like us! If you wish to ‘have a go’ yourself – Go to Tools > Pop Up Blocker (in Internet Explorer Browser) and set your own preferences. In Firefox – Tools > Options > Content. Here you can tick the pop up item and allow the sites you wish to use Pop ups on.